Kate O’Reilly joined the Georgia Law staff in 2013. She serves as a major gifts officer, and it is her responsibility is to grow private support for the law school. 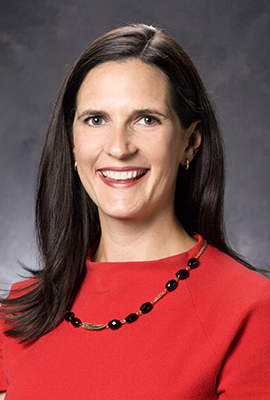 Previously, O’Reilly was the law school’s director of alumni and alumnae relations. Before coming to the law school, she served as the director of development for UGA’s College of Public Health, where she created fundraising proposals for foundations and corporations; raised major, annual and planned gifts to benefit the college; and provided stewardship to donors of the college through various communication outlets and events. From 2004 to 2006, O’Reilly served as the regional director and later as the senior regional director for the American Heart Association. In her leadership role, she managed a wide range of staff responsible for several fundraising campaigns and implemented key fundraising activities. She earned her bachelor’s degree from Presbyterian College and her master’s degree from UGA. Kate and her husband, Steven, live in Watkinsville with their two sons, Bart and George.